Motorola pulled the curtain back even further on the recently revealed Atrix HD, announcing AT&T as the smartphone's carrier. The Atrix HD will grace AT&T stores across the country for a reasonable $99.99 starting July 15. The price is almost as slim as the smartphone, which borrows the style of Motorola's Razr and Razr Maxx handsets with a Kevlar back and frame measuring just 8.4mm deep and weighing a fit 140g. Motorola packed a lot of phone into the Atrix HD's thin build, with a 1.5GHz processor, 1GB of RAM, 8GB of internal storage, 4.5-inch HD ColorBoost TFT (720x1280) display, Ice Cream Sandwich, 8-megapixel rear camera with LED flash and 1.3-megapixel one in front. The Atrix HD also includes a microSD card port and a 1,780mAh battery, as well as compatibility with the Motorola LapDock 100 to use your smartphone as a laptop in a pinch. It also features Motorola's SMARTACTIONS app, which allows you to set the handset in different modes throughout the day to improve battery life. 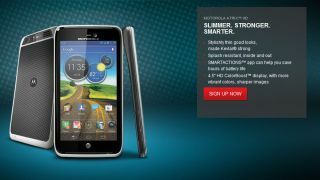 Motorola is bringing the Atrix HD exclusively to AT&T July 15 for $99 with a two-year contract.